In an age marked by a proliferation of “fake” news, one would think legacy media, steeped in long-developed codes of journalistic ethics, would not engage in conflicts of interest and conspiracy theories. Yet that is what New Jersey residents have been subjected to all week, with print newspapers across the state, many reeling from the financial backlash of the digital revolution, advocating for what has amounted to a taxpayer-funded subsidy of their industry. First, let’s look at the merits of the bill –then we’ll take a look at our print counterparts. Nonsense. First, publishing legal notices online is a point-and-click activity that could be performed by any administrative assistant in a matter of seconds – likely, the same person who currently has the time-consuming task of sending a slew of notices to a print newspaper. Second, the obligation to “fortify” websites against hacking comes out of nowhere. These aren’t classified secrets – they’re simple notices that require the same security protections as any municipal website already employs. One wonders what type of “fortified” security exists on the website of an average small, weekly newspaper in New Jersey. The print industry also claims citizens would become less informed. Again, nonsense. Besides fellow journalists and the occasional gadfly, it is hard to believe that anyone regularly reads through piles of pages of legal notices to, possibly, find something remotely relevant to their own community. Placing legal notices on municipal websites, we believe, would actually increase access to legal notices since they would appear on familiar websites. Perhaps a future version of the bill could also include a state-run site with a central bank of notices from each community. The print newspaper industry’s dog in this fight isn’t much of a secret: it’s money. 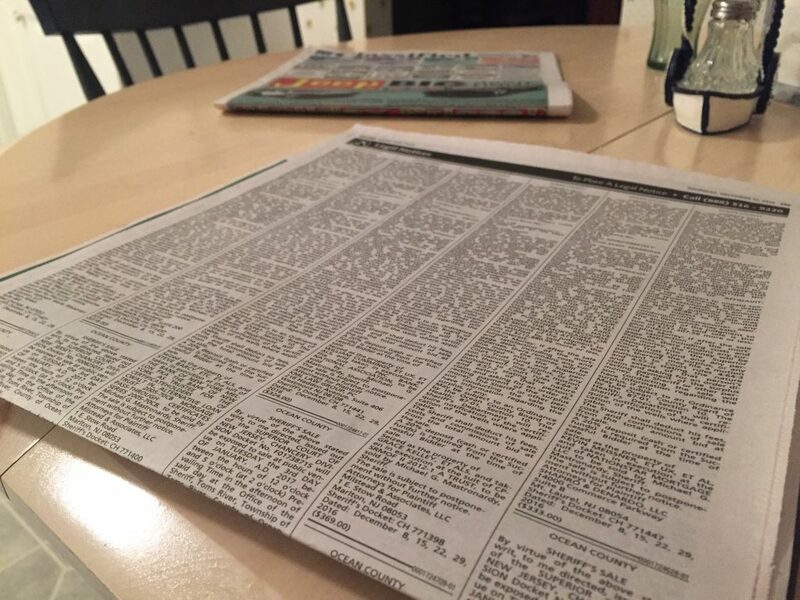 Print newspapers are currently reaping an average of $14,000 worth of legal notices from 565 municipalities in New Jersey. This amounts to about $7.9 million of taxpayer money being showered upon the same newspapers that have routinely cut back their local coverage and become less relevant to the very citizens they supposedly believe will be less informed. Perhaps the industry should have better adapted to the digital world, spent less on bonuses and trinkets for executives and improved the quality of their coverage so they would not have to rely on what amounts to a life support machine of legal notices. The “revenge” excuse is even sillier. Proposals to reform the legal notice requirement go back many years. The newspaper industry has managed to kill all efforts in the usual manner – donating to, and influencing, the right politicians. The print industry even quashed an effort to allow towns to publish notices on websites like Shorebeat, which have lower overhead and could publish the notices at a significantly reduced cost. Considering our Brick site alone reaches between 75,000 and 100,000 readers per month, such a compromise would have allowed towns to inform their citizens on a well-known, local platform. But it’s not about informing citizens – it’s about profiting from an outdated practice. It also must be considered that the state press corps may be suffering from a collective guilty conscience. Some of our colleagues have, sadly, managed to parlay an act of stellar journalism – the uncovering of Bridgegate – into a juvenile bash-fest of a governor whose views differ from the political leanings of most journalists. Moving legal notices to digital filings will save taxpayer dollars, improve access to citizens and force the newspaper industry to either adapt and improve its product, or allow the market to decide its fate.